Huge GI Joe Club News!!! Add-on Vehicle Announced For Optional Purchase With Membership Figure! Based on the colors of the original H.A.V.O.C. driven by CROSS-COUNTRY, this vehicle features an opening canopy, free-rolling wheels, a moveable windshield wiper and hi-velocity X-1 torpedoes. Plus, you can elevate the vehicle’s launcher to rotate 360 degrees and fire four missile accessories! The H.A.V.O.C. MK-II combines the stamina of a tank with the handling of an off-road vehicle. The result is a machine that makes its own road over tough terrain to battle the evil forces of COBRA. 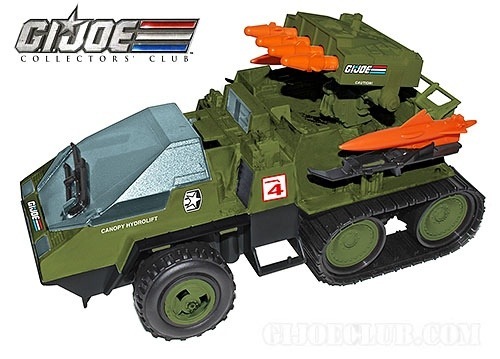 Categories: GI Joe Club, GI Joe News | Tags: Exclusive Vehicle, GI Joe Club, HAVOC, Membership Figure | Permalink. Nice redux of the Snowcat. I’m glad they’re doing this. Always loved the Snowcat but loathed it’s limited application. But the ski-missiles have to go. A pity Hasbro couldn’t have included a conventional set of missiles. Or machine guns a la HAVOC.